As we approach November 11th and the ceremonies organized to commemorate what it represents, the theme of remembrance occupies a special place in my readings. Just the other day, I found a very interesting and informative article about the historical evolution of the Remembrance of the Gallipoli campaign in Turkey, under the pen of Mesut Uyar of the University of New South Wales in Canberra (Australia) in First War Studies. Since the evacuation of the last Anzac troops at dawn on December 20th 1915, marking a Turkish victory, the process of memory and remembrance on the Turkish side has been all but easy. Subjected to political, religious, military and identity considerations – just to quote these examples – Turkish people incessantly advocated the development and promotion of awareness of the sacrifices of their fellow citizens during that famous campaign. And it is one of the most interesting aspects of this article. Family and friends of veterans, soldiers and officers who served and fought on the peninsula along with university students were at the vanguard of this evolution. With our Western eyes and conceptions, it is often too easy to focus exclusively on the military feats of Australians, New Zealanders and other Allied troops and to ignore the gallantry of the Turkish soldiers and their commanders – the most notorious being Mustafa Kemal Atatürk – founder of the Republic of Turkey. Doing so, we forfeit the opportunity to better understand and appreciate the impact of the Gallipoli campaign in the national identity and consciousness of Turkey, a country that is not only member of NATO but also an ally in the fight against terror. Thanks to military historians like Mesut Uyar, we can better appreciate the efforts deployed by the Turkish people to bring the valor of their ancestors on the battlefield to our attention and appreciation. The recent commemoration of Anzac Day and the battle of Gallipoli brought my attention to a very interesting article published in 2015 in the British Journal of Middle Eastern Studies by David J. Charlwood. In this fascinating article, the historian establishes a clear link between the withdrawal of the Allied troops from Gallipoli and the British decision to support the Arab revolt. But the negative progression of events for the British and Allied forces on the Gallipoli peninsula was associated by a desire, from the same McMahon, to ensure that the foreseeable debacle would mean a loss of prestige, notably in the eyes of the Arabs and hence the high potential of their alignment with the Turks. It is just fascinating to realize the direct link between what happened on the beaches of Gallipoli and the sands of the Arabian Desert. I just started reading Bruce Hoffman’s recent book, Anonymous Soldiers: The Struggle for Israel, 1917-1947. For the record, Vladimir “Ze’ev” Jabotinsky was a Zionist leader and he was co-responsible of the creation of the Jewish Legion during World War I. 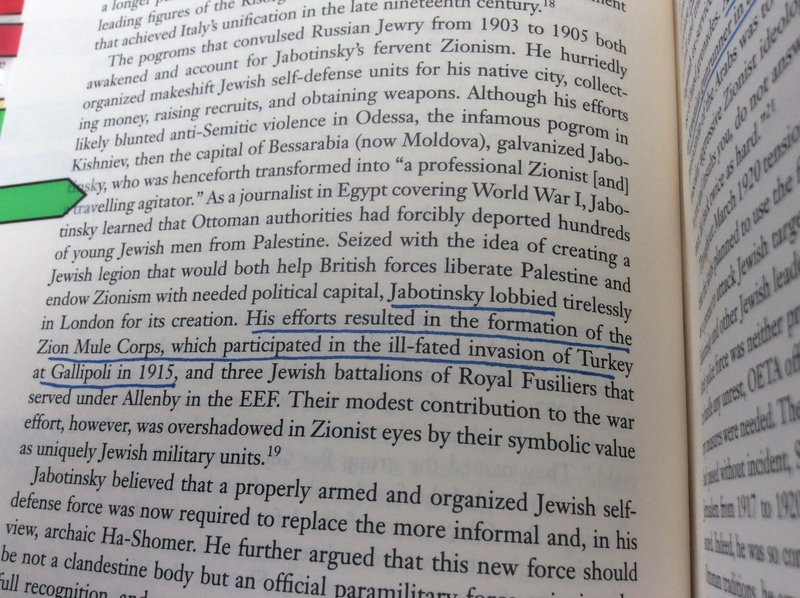 While I was aware of the existence of the Jewish Legion, I ignored the Gallipoli component of its involvement for King and Country (or, I should write Empire). Modest as this contribution might have been, it is nevertheless an excellent example that Israel – even before it was reborn under this name in 1948 – stood with the Allies (I think we can call them the West) when the going got tough. Enough for now. I’ll publish a review of the book when I finish the last page of it. But I can already say that this is a very enjoyable read and a good investment. Photo credit: Bauer Griffin. Montage: Pinso. 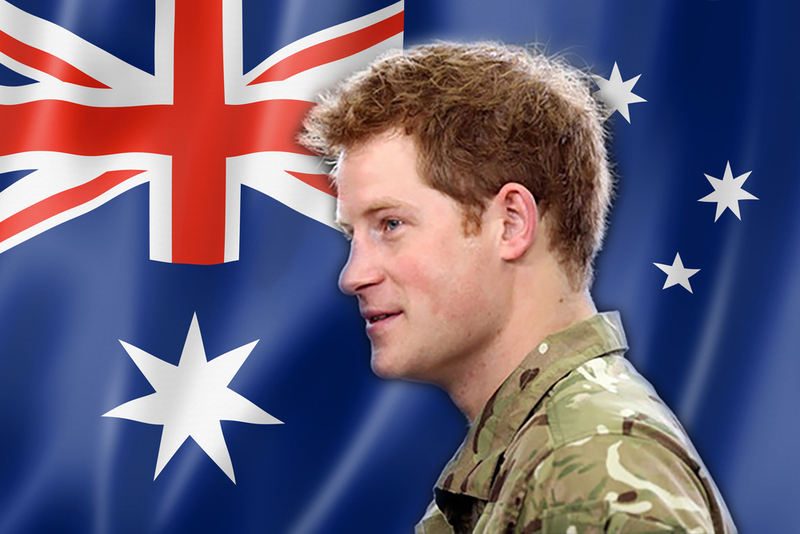 His Royal Highness Prince Harry will arrive in Australia next week for a four weeks long attachment to the ADF. If there is one trademark of Captain Wales, as he is know in the British Army, it’s that he puts his money where his mouth his. Far from shying away from grunting, he seems to relish those assignments. It will therefore be a real pleasure to follow him during his presence in Australia and also when he travels to Gallipoli for the 100th anniversary Remembrance ceremonies. For those of you who are interested in military history – and I suspect you are if you took time to visit this blog – you might also like to know that King and Country (the largest producer of collectible toy soldiers in the world) has just released some items commemorating the famous and tragic battle of Gallipoli in 1915. Have a look for yourself and you will understand why I decided to take a few moments to write about these figures representing the brave ANZACS servicemen.